Well - day 1 was frenetic and not as anyone was expecting it to turn out. Stuart Broad has been out on the field bowling in the warm-up and it looks as though he will take the field although he wasn't looking 100% at his best. Shane Watson also has a niggle but that's not unusual for him. The 50 partnership is brought up from 62 balls. Agar is going at a run a ball. He plays a beautifully timed cover drive to bring up the 50 partnership - this is particularly annoying for England. Finn continues - Anderson is off the pitch, He does it again - bowls short and Agar pulls him for 4 backward of square. In other news - Ricky Ponting has a century in his final first-class innings. 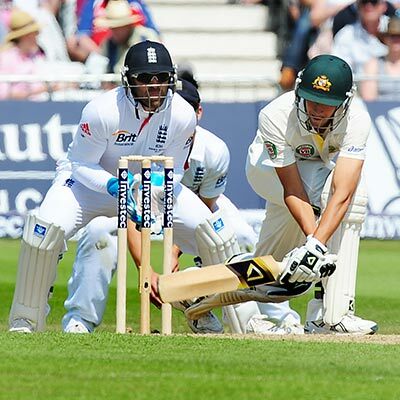 Back to the Test - why is bowling short? What's going on in Finn's head. Then he bowls outside off, Agar drives expansively and it beats Bairstow for four. The lead is just 37 now. This is a proper momentum swing. Initiative handed back. Eng had the chance to nail the game. Now it is a scrap again. Swann to Hughes who plays out a maiden. He is a bit of a passenger in this partnership. What a day for Agar. He will be bought a lot of beers tonight. Anderson is back on the pitch and back into the attack. Good decision, Finn was having a mindmelt. his spell was 4 overs for 32. 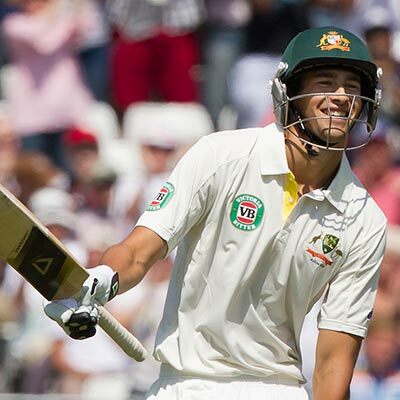 Agar plays aggressively - which is exactly the way a number 11 should play but they are proper shots. He drives the second ball for 3 to move towards his half century. That is the record for a test debutant batting at 11. Embarrassing for England really. Hughes drives a decent length ball back up the ground for 2 to move to 40*. Followed by a clip off his legs square for a single. Agar then drives to the man at deep cover for a single. Hughes pushes the final ball for a single. Agar pushes a fuller length ball from Anderson into the offside for a single. Thought about 2 but decided against. Hughes then plays an off drive on the up for a single. They are working the strike very nicely here. This is proper cricket unlike some of the garbage we saw earlier. Big shout for LBW 4th ball but it's pitched well outside leg stump. Agar brings up his half-century with a run down to third man for 2. Hughes clips the 3rd ball of Swann's over quite unconvincingly into the legside for a single. Hughes is just trying to get Agar back on strike. Cook is messing with his field a lot - he doesn't quite know what to do. Agar takes two steps down the wicket and lofted on drive for 6. This is incredible stuff. Considering how highly rated the England attack are it would be impressive to concede the highest test score by a no.11 twice in 13 months. Hughes edges towards his half century with a single from the first ball. Agar happy to defend the next two balls from Anderson which are good balls. But the 4th is shorter and wider and he pulls it for a single. HUghes clips into the legside to bring up his half century from 94 balls. Agar now highest score by a number 11 Australian batsman ever as he moves to 63 with a four driven beautifully just wide of midon. Then follows it up with a wonderful late cut for four through 3rd man. These are beautiful shots. 9 from the over and the scores are level. Great Game for Agar, however, demoralising for England, come on Jamie. It's then edge through second slip (vacant second slip) for another 4. Then drives the final ball through the off-side for another 4. Agar nudges out the 4th ball behind point for a single. Hughes plays out the final 2 balls. There'll be one more over before late lunch. If Broad is Injured kep him away from the Bowling. We are getting a good enough kicking without helping them. Is there a slight possibility that Agar may be offered some alcohol this evening? Agar leaves Broad's first ball well alone - it's wide outside off and no need to play at that. He defends the 3rd ball back into the pitch - batting well beyond his tender years. Then can push the 4th one which is wide just gently for a single. Hughes defends the last ball. Phil - I think you are right, the lad will be bought a shandy or two tonight. Extraordinary session. Australia lead by 14.